Gay Church of England cleric Jeffrey John is coming under pressure to step down from his new position of Dean of St Albans. A group of around 40 evangelical clergy and laity in the St Albans diocese met on Tuesday to express their "dismay" at his appointment. 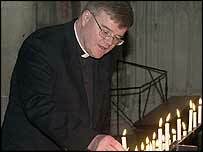 It comes less than a year after he was forced to withdraw his acceptance of the post of Bishop of Reading. His appointment had sparked a storm of protest from Anglican conservatives. Since then, the first openly gay bishop has been consecrated in New Hampshire in the US. And the Anglican Communion has set up a commission to examine how to handle the issue of gay priests. In the meantime, the government and church authorities were urged to hold off making controversial appointments until the commission's findings were known. Downing Street's announcement last week of Dr John's appointment as Dean of St Albans has provoked further anger among some sections of the Anglican community. In a statement, the St Albans Diocesan Evangelical Fellowship said the move was a "serious error" of judgement. The group said it was "aggrieved" that the Bishop of St Albans, the Rt Rev Christopher Herbert, had agreed to the appointment. Its "disquiet and concern" was further compounded by statements made at a news conference last week by Dr John and Bishop Herbert. "We regard their views, as reported, as wholly erroneous and contrary to scripture," the statement said. "We respectfully request that the appointment be withdrawn," it added. Canon Nicholas Bell, of St Mary's Church, Luton, said the appointment had been "sprung" on the diocese. And he said he was considering resigning his post as a member of the college of canons at St Alban's Cathedral. "This drives a coach and horses through what we had considered to be a time for reflection and deep prayer," he said. A statement from the diocese said Bishop Herbert was out of the country leading a pilgrimage to Santiago de Compostela in Spain. But he would be "pleased" to meet diocesan clergy and official representatives of parishes concerned about Dr John's appointment after his return to the UK on 7 May, it said.